Sequels can be tough. There seems to be a need to incorporate what made the original successful, while also trying out new ideas at the same time. Additionally, the characters need to grow and show that they can handle any new problems thrown their way. In The Arctic Incident, the sequel to Artemis Fowl, I found more of the same military sci-fi fantasy elements present, but with changes to the characters that took away a lot of what I liked about them in the first book. And by characters, I specifically mean Artemis Fowl. 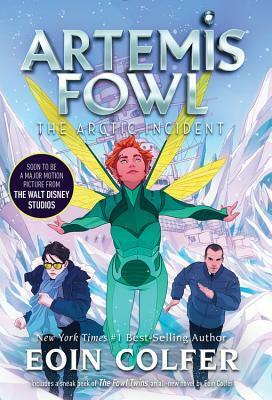 While the first book in this series contained a confident, coy, and conniving teenage super-genius, The Arctic Incident took Artemis Fowl and expanded those brief moments of emotional vulnerability into an entire character. Perhaps this was due to Artemis joining forces with the same magical creatures that he swindled out of their gold in the first book, or maybe it was due to Artemis finally being able to reunite his family. Either way, this main character didn’t seem nearly as interesting to me in this book as he did in Artemis Fowl. Furthermore, despite containing slightly different enemies and goals, The Arctic Incident pulled out the same tricks utilized in the first book. I did learn a little more about the magical realm contained in this series, but not nearly enough to justify a full book here. I guess when it comes right down to it, I’m not a fan of the Mulch Diggums character since he generally seems like an addition to the series that’s only there for fart jokes. Granted, I know this series is for children, but I also know how quickly this type of humor falls flat for me, especially when it’s practically repeated verbatim from the first book. A “meh” sequel that lost a lot of what made the first book good; I give The Arctic Incident 3.0 stars out of 5.